Just because I can't shop, doesn't mean I can't live vicariously through enabling your shopping! These little cuties just landed in the J.Crew Factory shop (loving their new site! ), and I think you should jump on them quick - they are not going to be on the shelf for long! You are correct...I do want all of those sweaters!!! I want all of those!!! so cute!! You're right, I do want these sweaters! SO adorable, the bow is my favorite! Yes, I want all of them! Such adorable sweaters. I'm wait for old navy to have there 75% off sale to get a couple new sweater for this coming up winter. you're right!! i really do! p.s. love the new look of your blog. so pretty! You're right! I'm dying for that bow sweater but can't quite justify the $61.50 price tag...ohh the torture! 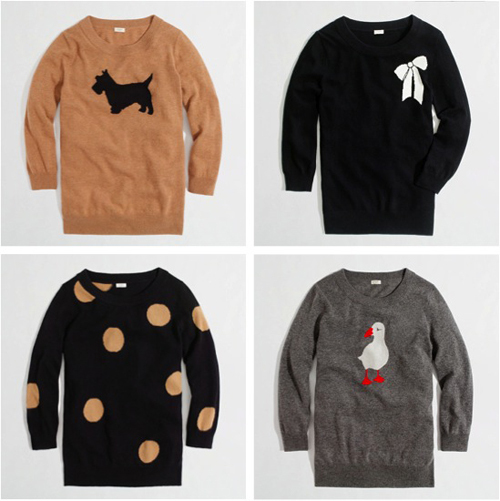 I totally SAW all of these adorable sweaters at the J.Crew Factory store, today (and actually thought of you)! The little scottie dog and duck are toooo cute, but I haaaddd to have the heart sweater (I assume you've seen it...maybe you have it. There was a picture of it on your blog I think). I am giddy with excitement to wear it! Sorry about your shopping hiatus, but your 30x30 outfits are fantastic so far! You don't look restricted at all! !